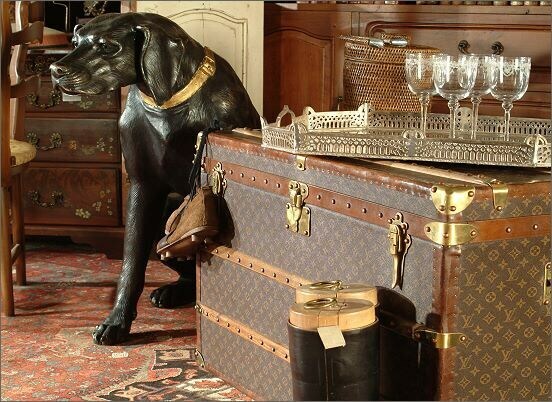 Louis Vuitton the travel trunk 1885. Source INPI – www.inpi.fr. the Monogram Canvas design was not created until after Louis Vuitton’s death; it was created by his son, Georges. 1854 – Vuitton opened his first store in Paris on Rue Nueve des Capucines, founding Louis Vuitton Malletier (“Louis Vuitton Trunk-Maker”). 1860 – Vuitton opened a larger factory in Asnières-sur-Seine to accommodate increased demand. 1867 – Vuitton entered the Universal Exhibition at the World’s Fair in Paris, winning the bronze medal. 1872 – Creation of the red and beige striped canvas. 1876 – Creation of the wardrobe trunk, which contained a rail and small drawers for storing clothing. 1880 – Georges gets married and (on the same day) is given control of the business. 1883 – Georges’ son Gaston-Louis is born. 1885 – The first Louis Vuitton store in London opens. 1888 – The Damier Canvas pattern is created by Louis Vuitton in collaboration with Georges, and bears a logo that reads “marquee L. Vuitton déposée” (which literally means “mark L. Vuitton deposited” or roughly “L. Vuitton trademark”). 1889 – Vuitton wins the gold medal at the World’s Fair in Paris. 1892 – Vuitton dies;the Vuitton company begins selling handbags. Age d’or de la Marque Louis Vuitton (1893-1936) After Vuitton’s death, Georges made Louis Vuitton a worldwide corporation. 1893 – Georges displays Vuitton products at the World’s Fair in Chicago. 1894 – Georges publishes his book “Le Voyage”. 1896 – Georges designs the “Monogram Canvas” It came to be called “Monogram Canvas” its graphic symbols were based on the trend for Japanese/Oriental designs in the late Victorian Period. This can be considered the first “designer logo”, since Georges was driven to create this pattern to prevent further copying of Vuitton patterns (counterfeiting had already begun by this point). Georges then sailed to the United States, in which he toured various cities such as New York, Philadelphia, and Chicago. He sold Vuitton products during the visit. 1899 – Georges exhibited Vuitton products at the maiden Paris Auto Show. 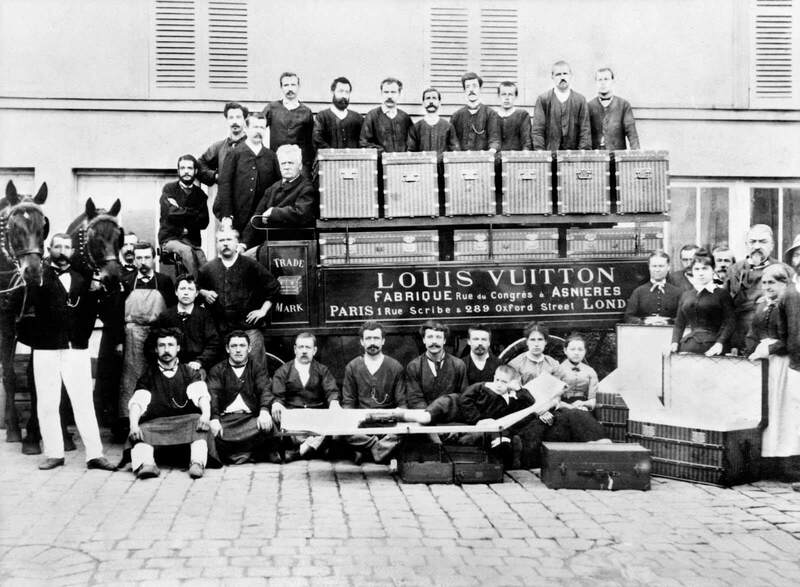 1900 – Georges Vuitton was given the honor to set up the “Travel Items and Leather Goods” section of the 1900 Paris World Fair. 1901 – the Louis Vuitton Company introduced the ‘Steamer Bag’, a small handbag to be kept inside Vuitton luggage trunks. 1904 – Georges chaired the jury for the St. Louis World Fair. 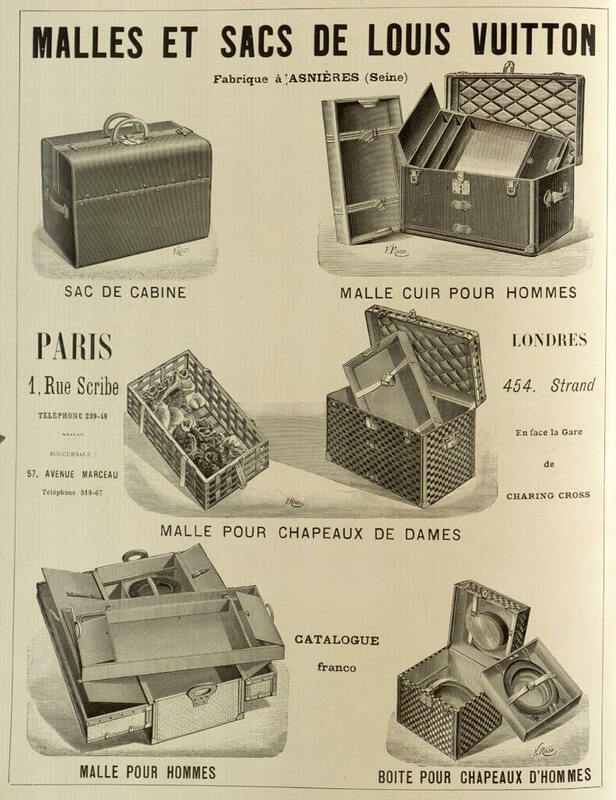 In the same year, the Louis Vuitton company introduced a new line of trunks that have special compartments for items such as perfumes, clothing, and other goods. 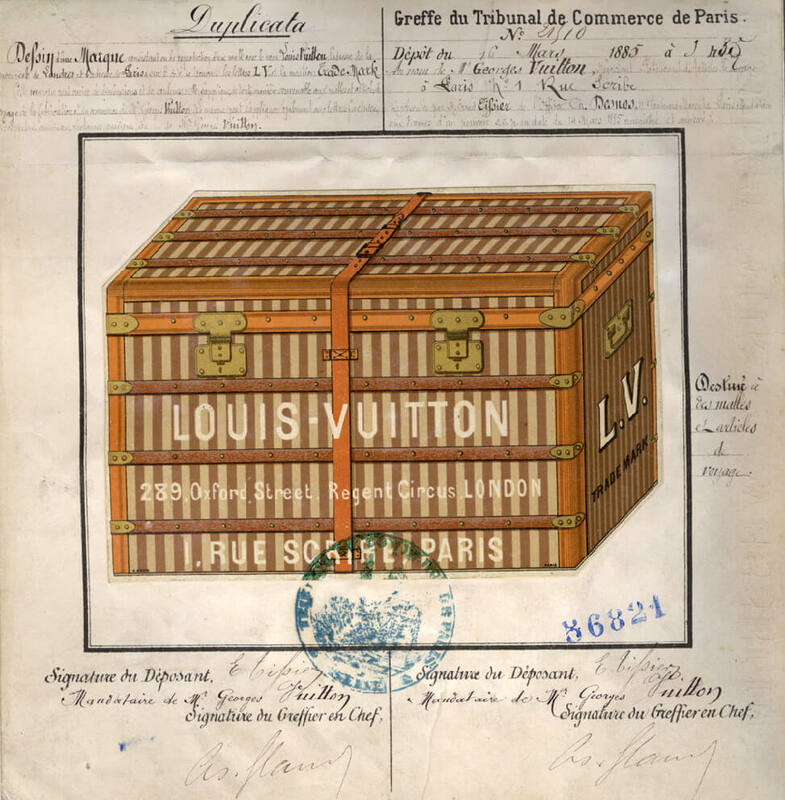 1906 – Georges’ son Gaston-Louis married Renee Versille and Louis Vuitton introduces trunks for automobiles. 1914 – The Louis Vuitton Building opens in Champs-Elysees. The building was the largest travel-goods store in the world at that time. Store locations open in New York, Bombay, Washington, London, Alexandria and Buenos Aires as World War I begins. 1924 – Only eight years after the end of World War I, the ‘Keepall’ is invented. This bag foreran the duffel bag in a travel bag for light travel to keep necessities in. 1929 – The seventy-fifth anniversary of Louis Vuitton, a toiletry case is introduced specifically for opera singer Marthe Chenal. It could fit bottles, brushes, mirrors, powder boxes and more toiletries. 1931 – Louis Vuitton introduced exotic bags such as a handbag of crocodile skin, as well as elephant hide handbags for the Colonial Exhibition. 1932 – Louis Vuitton introduced the Nóe bag. This bag was made for champagne vinter to transport bottles. 1933 – The Louis Vuitton Speedy bag was introduced. 1936 – The golden age of Louis Vuitton ends as Georges Vuitton passes away. Estimates attribute Georges Vuitton with over 700 new Vuitton designs. Gaston-Louis Vuitton assumes control of the company. The secretary trunk is introduced for Leopold Stokowski, a conductor. Corporate Age of Louis Vuitton (1937 – Present Day). 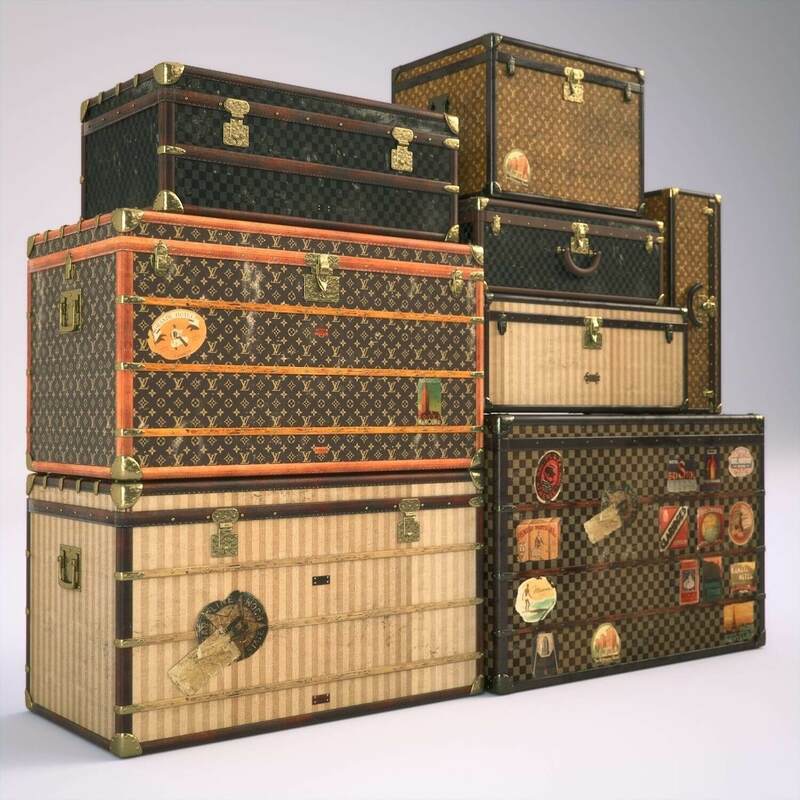 In the middle of the XIXth century, Louis Vuitton created flat trunks (flat cover replacing the curved lid) which, thanks to their shape, can be stacked on top of one another; then he designs various models corresponding to particular uses: trunk bed, trunk secretary, shoe trunk, etc.